Dairy farmers are committed to managing manure responsibly. 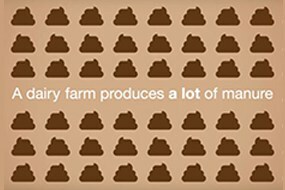 What do dairy farmers do with all their cows’ manure? Dairy farmers actively recycle manure to help control odor in the community. Farmers remove manure from barns to a temporary storage, which can include a pit, tank or holding pond until it can be used for fertilizer. Federal, state and local clean water laws regulate how manure is applied on cropland, so nutrients are absorbed by crops, not groundwater. Dairy farmers also are required by law to keep detailed records about many aspects of the farm, including how they store and recycle manure. How do dairy farmers make sure manure doesn’t get in our water supply? Dairy farmers develop nutrient management plans and follow strict guidelines on when they can apply manure on the farm. They monitor weather and ground conditions to determine ideal application times making sure they don’t apply it when manure runoff might be likely. Dairy farmers also may proactively plant buffer strips of thick heavy grasses and plants on crop fields to prevent manure from entering nearby streams. How is Manure Managed on a Dairy Farm? What Happens To All That Manure?